Melbourne scuzz-punkers Clowns have carved out a bloody impressive little niche for themselves over the past few years. Somewhere along the highway they've managed to cook up a ripping new full length, Bad Blood, due out 20th February. They've booked a mega national headline tour to launch it, with special US guests American Sharks. Clowns embody the carefree, kick-around attitude that helped make Australian guitar music a worldwide fascination. Their rapid-fire 2013 debut album I'm Not Right was labelled 'savage', 'sharp' and a 'full on onslaught.' 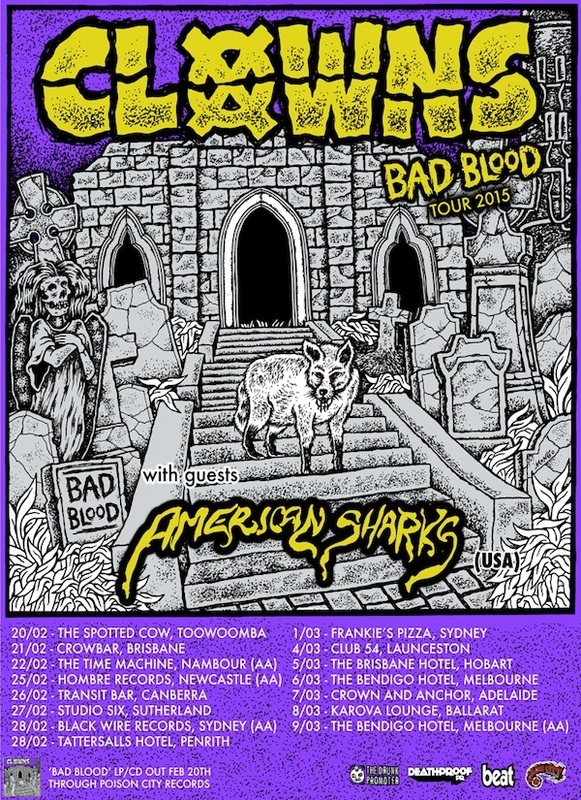 Fast forward twelve months and Clowns have completed a tough touring apprenticeship with some of the nation's greats; Hard Ons, The Meanies, Frenzal Rhomb, Cosmic Psychos and more. Plus slots with Poison Idea and Adolescents. They've kicked arse on their first NZ tour and the new year promises even more international tomfoolery. Aussie fans can stoke out on the forthcoming national album tour, featuring US stoner punks American Sharks, who might just give the hard-partying Clowns a run for their money when it comes to visceral noisemaking. Bad Blood was written amongst the suburban jungle of Cheltenham (where the band grew up) in a complex that houses a bakery, a cattery and a morgue, right across the road from a cemetery. Recorded at St.Kilda's lauded Hot House Studios with Craig Harnath and Jeremy Giddings, using their famous Neve desk and a truckload of vintage and boutique gear, the production is rich, raw and dirty. Urgent but natural. Reflective of the band's can-do DIY approach and go hard or go home attitude. The making of Bad Blood was intentionally kept close to home. Clowns have made an album that is truly of Melbourne. Lyrically inspired by the band's native suburbs, the record was deliberately written, recorded, mixed and mastered in Melbourne. Wrapped in artwork by local artist Steve 'Mongo' Cohen that features local bayside landmarks. And it will be released via one of Melbourne's great independent labels, Poison City Records. Bad Blood is a true collaborative hometown effort, and a ripping one at that. Clowns are pulsing with Bad Blood. Symptoms may include fatigue, psychosis and shortness of breath. If symptoms persist please consult your local bartender at one of the below venues.